I love to cook but I admit...I am more passionate about baking. When it comes to baking, I like to bake all kinds of things like cookies, cupcakes, fruit pies, vegetable pies and sweet breads. If I had to choose a favorite...it would be cupcakes and cookies because they are so versatile and you can find a gazillion different recipes for both. Recently I had the opportunity to review the follow book for all of you. Book Synopsis: Learn to bake new and creative cupcakes using everything from the standard vanilla and chocolate to fruits and vegetables. These proven cupcake recipes can be easily recreated at home and also provide a fresh twist to some classics. There are the Tamarind and Guava cupcakes or the Hibiscus flower and Passion Fruit cupcakes that include exotic but easy-to-find fruits. There’s also a selection of all-time favorites: peanut butter apple, fruity cereal, and pumpkin spice latte. The versatility of vegetables can be found in sweet and savory cupcake flavors such as spinach, corn, and pepper. With step-by-step baking instructions for the cupcake, filling, and icing, you’ll soon be creating gourmet and delicious cupcakes that are sure to impress family and friends. 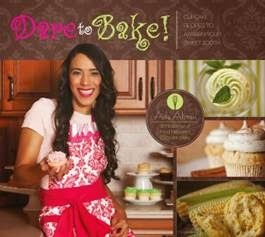 This book is perfect for the avid bakers who want to look beyond the typical cupcake recipe. My Thoughts: I collect cookbooks and have over 200+ in my current collection and I have to admit, this one is quickly becoming a favorite. It's a hardcover book with 88 pages. The foodie photography inside this book is simply mouth-watering!!! This cookbook goes way beyond the basic chocolate, white or yellow cupcake...yup, way beyond! These are gourmet cupcakes that you can easily make at home! Examples of Recipes: Pomegranate Ginger Cupcakes, Spiced Chocolate Cupcakes, Pear & Cranberry Cupcakes, Coconut Curry Cupcakes, Fruit Cereal Cupcakes, French Toast Cupcakes, Ham & Pineapple Cupcakes, Three Peppers Cupcakes and so much more!!! I am a banana and chocolate lover and when I saw that there was a recipe for Banana Chocolate Cupcakes I immediately did the happy dance! The recipe was inspired by frozen chocolate bananas. The base is a chocolate cupcake with caramelized banana filling and topped off with a caramelized banana icing. The author includes all three of the recipes so you can whip them up to perfection! All of the ingredients used are basic ingredients and the step-by-step instructions are super easy to follow & understand. There is a full color photograph with the recipe so that you know what they will look like when completed. We have a family reunion we will be attending later this month and I am going to make these cupcakes for sure!!! This is a beautiful cookbook and I am so excited that I now have a copy of it in my collection. I know I will be using this book over and over again! You can find it and many other books at Schiffer Publishing. I highly recommend this one to all of you!!! Disclaimer: Shelly H. has personally reviewed the product listed above. Shelly has not received any monetary compensation for her review. Shelly did receive a free product to try out so she could evaluate and use it for her review. Her thoughts & opinions in this review are unbiased & honest and your opinions may differ. Content on this blog is copyrighted, all rights reserved. We reserve the right to legally pursue anyone who violates our rights and/or steals our copyrighted material.